All aboard at the Whistlestop!!! 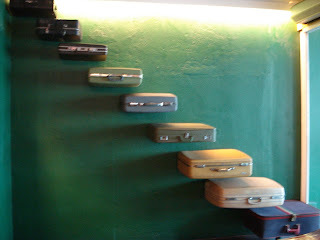 It somehow felt nostalgic, the moment we stepped into the newest branch of Whistlestop along Jupiter street in Makati. Our last Whistlestop visit happened four years ago and this was when Paul and I met up with a couple of fellow online sellers for an afternoon of chit-chats and good food. 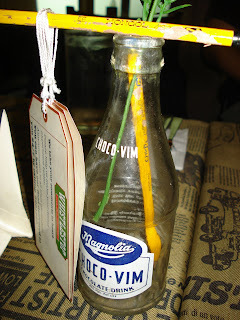 After that, Whistlestop bid us goodbye as the original owners migrated to the US. For something this good, we were hoping and praying that Whistlestop will come back. Our prayers were answered because early this year, Whistlestop finally opened its doors again under the management of young entrepreneurs Lex Ledesma and Dennis Gan. Over lunch last Sunday, we were invited by the owners to sample some of their well-loved dishes. We entered the cozy looking restaurant located beside Starbucks Coffee Jupiter which was just a stone's throw away from my previous office. Oh how I wish Whistlestop was already there when I was still working in Makati. As we exchange stories with fellow bloggers and the two hardworking owners of Whistlestop, the dishes started coming and for more than an hour we have tried quite a number of mouthwatering entrees that have made our lunch really memorable. Let me begin with the Spanakopitas (Php. 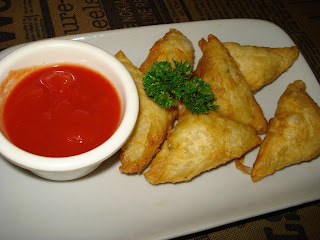 180) which is a filo-pastry appetizer filled with three types of cheeses. This starter is very light that we initially felt 6 pieces were not enough as we were enjoying every single bite of this cheesy wonder. Next came my personal favorite. 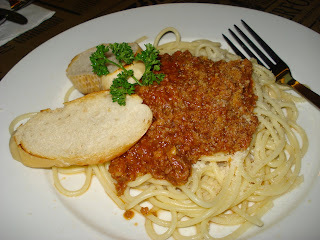 While I love to wine and dine, there will always be that one dish that I will forever love no matter how simple it is -- call it my comfort food, the Spaghetti Bolognese (Php. 180). No sophisticated Italian taste here, it's really just that sweet, meaty sauce over al dente spaghetti noodles that my mom would always prepare for us since we were small. Needless to say, I think I just had a Ratatouille moment there. 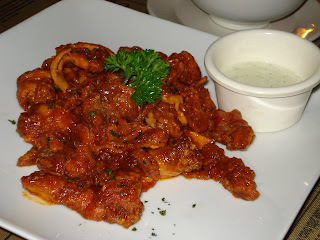 For my fellow bloggers who were brave enough for some spicy treat, they were obviously happy with the Boneless Buffalo Wings (Php. 220) which just has the right amount of kick that temporary lingers on your taste buds leaving you wanting for more. The blue cheese dip definitely paired well with the boneless wings. 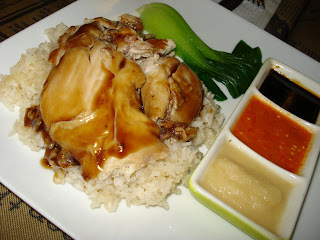 Whistlestop's Lex Ledesma was particularly proud of their Hainanese Chicken Rice (Php. 195) which is a set consisting of soup, steamed chicken and flavored rice. I took one bite and I immediately agree that this dish is really something to be proud of. The chicken meat was very juicy and tender and the soup was delicious. I would have loved it better though if the rice has more chicken flavor similar to how the locals of Singapore would have it. Nonetheless, the price of this dish is already a good deal as it is. 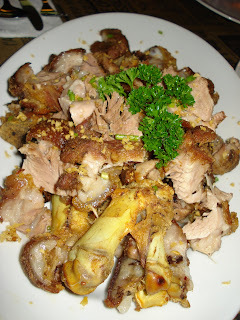 Another crowd favorite was the Crispy Pata (Php. 380 / 420). De-boned for easy serving, this dish is one of the things you should try out especially during a night out with friends. Finally, the sweet stuff. After welcoming back and enjoying a number of Whistlestop's specialties, then came a generous slice of the Banoffee Pie (Php. 150) which is actually good for sharing. A trivia here is that all of the desserts being served were created by their in-house pastry chef. We enjoyed this cake so much that we requested Lex and Dennis to consider selling whole cakes for customers who would like to serve these in their own parties. The two (equally delicious) desserts on the menu are the Mango Pannacotta (Php. 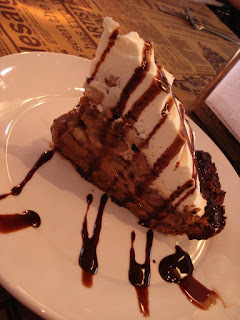 95) and the Chocolate Truffle Cake (Php. 120). While enjoying our meal, we can't help but be amazed at the simple but beautiful interiors of the restaurant. By the entrance lined a colorful set of luggages that can be easily mistaken for as a staircase leading to...well no where. Moving further in, we noticed a wide collection of vintage cameras which are owned by Lex. There's also a 50's looking coat rack complete with a trench coat and some classy-looking hats. 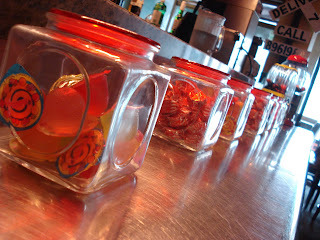 My favorite though are these tiny clear glass filled with yummy candies from our childhood! have you tried bugsy's chicken tenders?